Halloween is almost here. Some of you may have already had Halloween parties, some of you may have them coming. Some of you may just be getting ready for actual Halloween. To me nothing says Halloween party or Halloween dinner like soup or chili. It is something that warms ya up and gets the kiddos all toasty and ready to go. Tonight we go Trick or Treating...that's right. Our community always picks the Thursday before if Halloween falls on a weekend night. So tonight all my Little Men will get their costumes on and run the neighborhood in a frenzie loading up on the good stuff. Buzz and Woody have already had their debuts at our church party, but alas I was one of the adults in charge so I got absolutely NO pictures. This is the best picture I have so far...but tonight the boys are going to be forced to do a photo session with their loving mother (yes they will love it can you sense my sarcasm). So that means you get the complete photo run down of our families Toy Story Halloween tomorrow. Yes, I bet you are excited. For our church party we had a chili and chocolate cook off. Basically families could bring one or the other to be judged for prizes. As I was searching for recipes I came across this one from Best Bites...it was all in the title, I knew I had to make it. 1/2 oz unsweetened chocolate (1/2 of 1 oz baking square), shaved. Heat some olive oil in a large soup pot over med heat. Saute onions, garlic, red pepper, and turkey until turkey is cooked through, pepper, cumin, chili powder, brown sugar, unsweetened cocoa powder, tomatoes, beans, and beef broth. Add all of the sauce from the can of chipotles (here I dumped the can into a strainer that I had over my soup pot. ALSO...if you don't like a lot of heat I would only put in half of the sauce). Heat to boiling and then reduce to a simmer, uncovered, stirring occasionally until thickened. About 30-40 minutes. If you like more heat add some chopped chipotle peppers. Here add 3 tablespoons of vinegar and a small amount of the shaved unsweetened chocolate. Do it until taste. Too much chocolate will make it taste bitter. I did use about the whole 1/2 oz and I think it tasted great. Taste as you go to get your preference. Serve with sour cream, cheese, green onions. 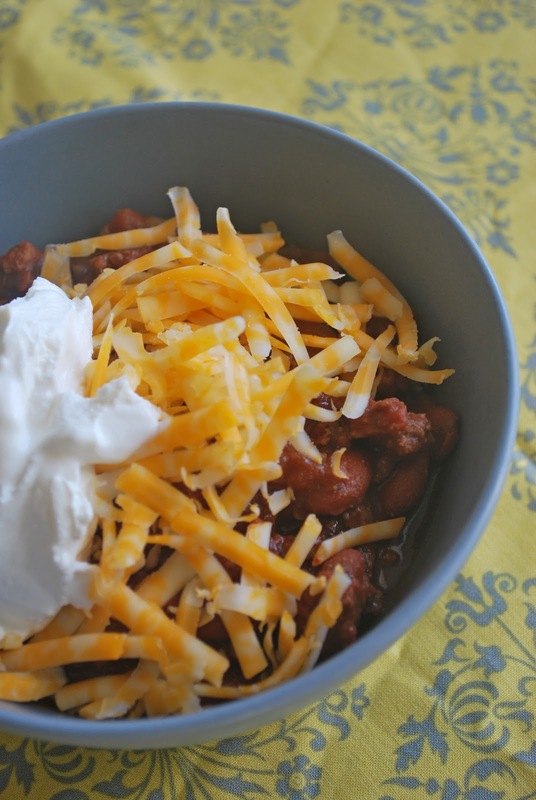 Whatever you chili toppings you like, throw them on top. Thanks Best Bites for this yummy recipe. GO over to their site they are having an amazing giveaway plus they are in a Better Homes and Gardens cook off and they need your VOTES. Today I can be found over at Ladybug Blessings. Kristen asked me to participate in her Handmade pact and I decided to share this easy peasy idea for a fun and creative pirate party invite. I hope you enjoy this tutorial for your favorite scalawag. Thanks Kristen for letting me join you today. and to go with all these cozy activities you always need a good pair of socks/slippers. 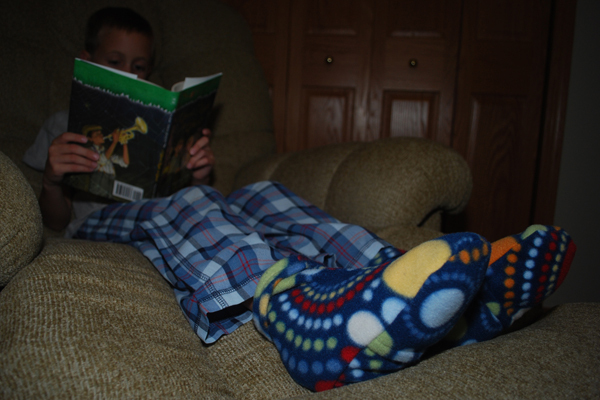 I can always find something fun and warm for my feet BUT it is really hard to find something for my Little Men. They don't do big clunky slippers and little boy socks are no fun. The Cozy Toesies and Comfort Wrap. The glorious part...these are not just simply socks and a scarf. 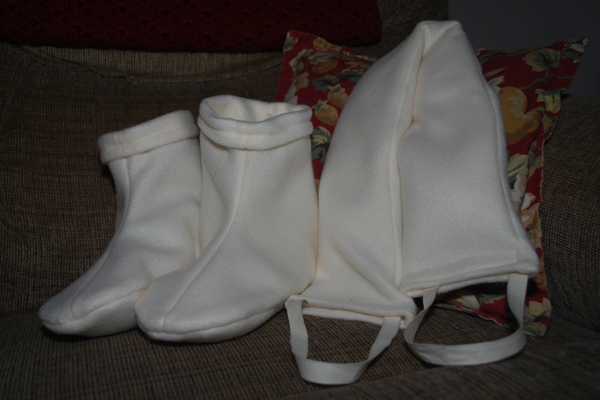 Cozy Toesies are fleece slippers with an enclosure on the sole for an insert. The Comfort Wrap also has an insert and can be worn around the neck, over the shoulder, on the stomach or anywhere you need relief. Use them hot to warm up, stimulate circulation, relax muscles or relieve stress, tension or pain. Use them cold to cool down or reduce minor swelling. Simply genius. I can't wait to sew up 3 sets of the for my guys. A cozy little place for there feet PLUS a warm wrap, which they will LOVE. 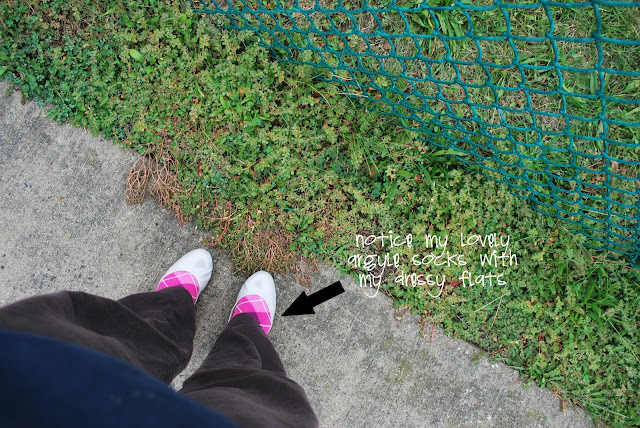 I love that with this pattern I can pick the fabric for these cozy slip-ons...no more boring boy socks here! I also LOVE that she is offering a free pattern to one of my readers! Woohoo we love a good GIVEAWAY. While working on said Space Ranger costume, instead of being rescued from danger I was met with it! These are the only band-aids I had downstairs. Is it bad to wanna punch a toy in the face? I mean look at his smug little face. Oh yum. No I mean, YUM. I mean salivating, have seconds, wish it were lady-like to unbutton your pants and have thirds YUM. My friend told me I had to make this recipe...lets just say I called her the next day and expressed my gratitude for leading me to the best pork recipe I have ever made. Just sayin'. We served it with this potato recipe. Preheat oven to 350 degrees. In a small bowl, stir together salt, pepper, cumin, chili powder, and cinnamon, then coat the pork with the spice rub. Heat the oil in a skillet over medium high heat until the oil is hot and rippling. Brown the pork, turning, about 4 minutes total. If you have a skillet that can go straight into the oven you can leave the pork in the skillet; however, if you are like me and don’t have an ovenproof skillet, transfer it to a foil-lined baking pan (like a 9X13-inch). Stir together the brown sugar, garlic, and hot sauce and pat on top of each tenderloin. Roast in the middle of the oven until a thermometer inserted diagonally in center of each tenderloin registers 140, about 25 minutes. Let pork stand in the skillet at room temperature for 10 minutes. The temperature will rise to about 155 while standing. Slice on the diagonal and serve, spooning the sauce from the skillet on top of the pork. I would say, "I hope you enjoy this as much as I did" but I KNOW you will so...'nuff said. This Little Man turned 4 today. I went into his room this morning singing "Happy Birthday". Almost immediately he covered his ears with his hands. So I stopped. Then it seemed to click what I was singing and what it meant and he got an impish grin on his face and then nodded for me to continue. Man I love this kid. It is now 2:48 in the A.M. 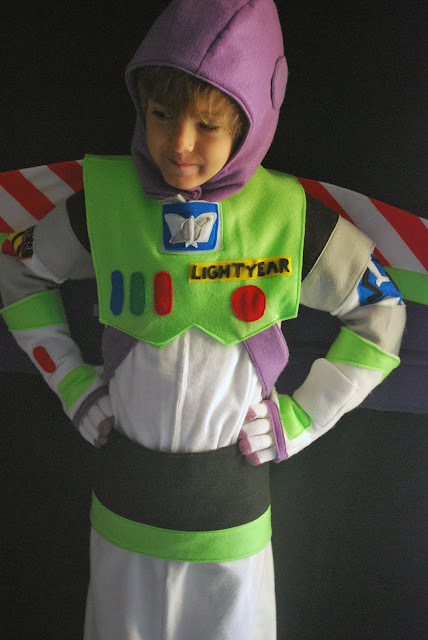 Yes the journey to a completed Buzz Lightyear costume has begun. This post should have been titled, "To Crazy and Beyond! "...but seriously don't you LOVE it. I mean L.O.V.E. it. You should see it on my Oldest Little Man..well you will have to wait...but seriously LOVE it. The glove sleeves came from my noggin but the hood came from a McCall's costume pattern...which I am too lazy to run downstairs for at the moment, so I let you know in the next Buzz post...yes there probably will be another one, sorry folks! look EXACTLY like Mr. Lightyear's digits. So easy to do. My Little Buzz can check gamma ray levels and communicate with Star Command in his very own quest to secure the galaxy's safety. This week there was some fabulous weather. Glorious and fall-y. Some days warm yet crisp and sunny. Some days overcast crispy and cozy. I heart fall, I mean I really heart it! Yes, yes I really heart fall. I had stayed bundled up all day...yes probably sewing and then realized I needed to pick oldest little man up from school. So yes I just threw on a pair of shoes and was seen in public like this. I pretty much rocked that BYU sweatshirt-brown sweatpants-argyle knee socks-dressy flat combo. Yes I am sure the other mothers were jealous of my style. What is your favorite fall activity?? One step closer!! Woohoo...or should is say "YEE HAW!" I looked at picture after picture of Woody. I wanted this belt to be all about the fun details and I wanted it to look just like his actual belt.. I think I got it close. I am so excited...hehehe. Yes ma'am one step closer...YEE HAW!!! You know last week how I said I was going to do one more apple dessert? Well here ya have it. YUM apple fritters. I came across this recipe a couple of weeks ago on The Pioneer Woman and stored it away for a glorious fall morning. We had one of those just this last Sunday. Cool, crisp plus it was a lazy morning...that all adds up to some fried apple goodness. Her recipe has either a glazed or powdered sugar option, well shoot...let's do BOTH. My little men by far enjoyed the glazed ones better. The apple fritter seemed to soak up the glaze, not to a sogginess level, but to a sweet mother there is a sugary goodness every where level. So if you have some apples just sitting around and it is going crisp outside, whip up some of these. Suggestion though, if you are a smaller family like us...cut the recipe in half. There was no way we could eat all of these AND they don't keep well. The glaze recipe is actually perfect for half a batch of fritters. In a mixing bowl, combine flour, sugar, baking powder, cinnamon, and salt. In a separate bowl, beat eggs with a fork, then add milk, melted butter, and vanilla. Gently fold in the dry ingredients to the wet, mix until just combined (do not overmix). Fold in apples. Add enough apples to make a really chunky batter. Heat a couple of inches of canola oil over medium heat. When it gets hot, drop a little bit of batter into the oil. If it sizzles and immediately floats to the top, the oil is ready. It it burns, turn oil down. Drop teaspoons of batter into the oil, about six at a time. Make sure to flip them for even cooking. Cook them long enough that they are golden brown and that the batter is cooked through, this is about 2 minutes or so. Remove and drain on a paper towel. Either dust generously with powdered sugar OR dip fritters in glaze...dip fritters while they are warm. Your kids wouldn't mind if you threw in glass of chocolate milk. Glub, Glub, Glub. Here comes Mr. Fishy. The best kind of fishy to have 'cause you don't have to feed him and he isn't slimy to snuggle with. Cut felt into 1 1/2" strips. You will need 8 of one color and 10 of the other. Cut two circles for eyes. Pin two different color strips together. Sew along edge with 1/4" seam allowance. Pin next strip to, making sure to alternate colors. Always pin like sides together. Sew again with 1/4" seam allowance. 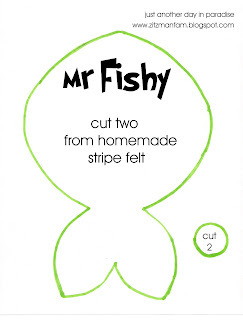 Using the Mr. Fishy Pattern, cut out fishy shapes. I pinned the pattern to the two sheets (like sides facing) so that I could line up the stripes. Cute slowly and carefully. Now you have two fishy shapes. Face them the opposite direction of each other and "eyeball" where to put the eyes...haha. Pin on and sew. With coordinating floss color, embroider on you little ones name or nick name. I choose to sew along the tail...and NO judging the embroidery imperfections! Pin Mr. Fishy together like sides facing. Sew around the edge with a 1/4" seam allowance, leaving a hole on the bottom to turn out. Turn out and stuff with your fluff. Make sure he is good and full...this assures that you don't have to feed him. Hand sew the opening closed. PS I really could use some hand sewing lessons...any takers??? Give it a kiss and pass it on with joy and maybe a bib. 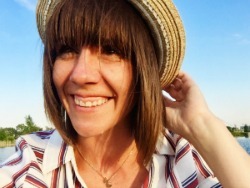 Hey all my blogging pals...I am entering this in a REALLY fun contest over at Sew Dang Cute. It is called Crafting with the Stars...haha GENIUS! There is no voting right now...whew! BUT the winners may come dependent on getting the most views on their icon...so go VIEW away!